Paris Saint-German and Kashiwa Reysol shared the spoils in the opening match of Al Kass 2019, following a pulsating encounter that exploded into life in the last few minutes. Barcelona and Cameroon legend Samuel Eto’o performed the ceremonial kick off to get the game underway, with Reysol’s combative striker Yuki Shimizu catching the eye in the early stages. However, it was midfielder Naito Saito who went close to opening the scoring for the Japanese on six minutes, his short-range effort smothered by Romain Sallard, who also confidently claimed the resultant corner with a minimum of fuss. The French keeper was called into action again soon after, when Hayato Fujimoto crossed well from the right and Shimizu planted a firm header that Sallard did well to save. He was quickly establishing himself as PSG’s standout performer, and had to once again react quickly to keep out Daichi Sugawara’s curling effort direct from a corner. 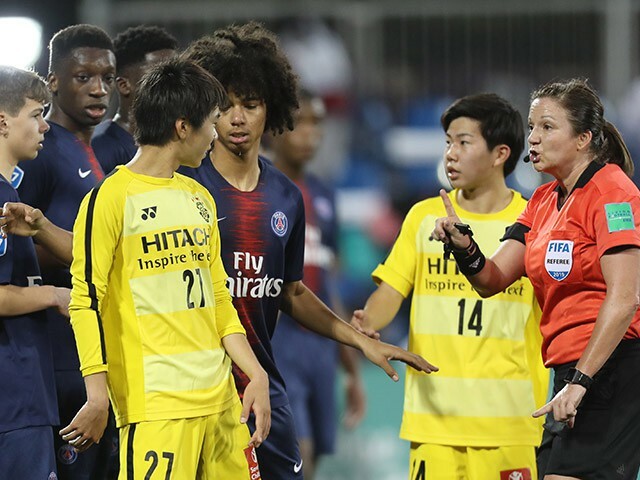 Almost 20 minutes passed before PSG had a chance of note, after the ball ran under Kashiwa centre back Hayato Tanaka’s foot to let in Samuel Noireau, whose hard and low drive forced a good save from Masato Sasaki. By now, the game had settled into a familiar pattern, with Reysol dominating possession with patient build-up play, while PSG sought to break swiftly on the counter. The first half drew to a close with Kashiwa in the ascendancy, but unable to break the deadlock due to a resolute Parisian defence. PSG are the only club apart from Aspire Academy to have participated in all eight editions of the tournament, and are also the record holders, having taken the cup home on three occasions. Meanwhile, Kashiwa Reysol are competing for the fifth time. Both sides are therefore familiar fixtures at Aspire Zone. the tournament also boasts an all-female match officials roster. Canadian referee Carol Anne Chennard acquitted herself well in this opener, content to let the play flow whenever possible. Ten minutes into the second period, Noireau went close with a fine drive that Sasaki could only parry, but the danger was cleared by Reysol’s alert backline. By now, the game was developing into a full-blooded encounter, typified on the hour mark when Sugawara saw yellow following a thundering challenge on Hubert Muamba. On 70 minutes, hard-running attacker Noireau was withdrawn for Edouard Michut, and the French side’s attacking threat was blunted as a result. Kashiwa continued to fashion the better chances, but Sallard performed admirably to keep the French side from conceding. And - implausibly and against the run of play - PSG appeared to have stolen a winner with five minutes remaining, when Tidjany Chabrol forced the ball home following a frenzied goalmouth scramble. It was desperately cruel on Kashiwa, yet they refused to be beaten, pouring forward and snatching a sensational 92nd minute leveller when substitute Hidetaki Maei crashed a rising effort in off the bar. The capacity crowd at Aspire Academy had witnessed a thrilling finale to an engrossing game – one that has already set a high watermark for Al Kass 2019.